I have been a fan of Iceland for a fairly long time. I was very much a Bjork fan and whilst watching interviews of her in her native Reykjavik, I paid a lot of attention to the backdrop. I have always wanted to go to see the volcanoes and ice floes etc. So when Trapped turned up on Beeb 4 a couple of years ago, I was naturally interested. It has to be said, I didn't know what to make of series 1, but I kinda got into the groove of it. Series 2 has been a lot better, though a few things perplexed me. Why was Inspector Norse was playing 20 questions with the killer? It is not like he doesn't know his own daughter is likely to be bound and gagged in a Scandinavian ravine. Me: WTF? Andri - Thorhildur is drowning in a puddle. Can't this speed up a bit? Second thoughts, no leave her there. Still, I enjoyed it - nay even shed a tear when a key character died. As for the rest, well, no spoilers but all I can say is, don't fall over in a pig sty at dinner time. Or any other time. 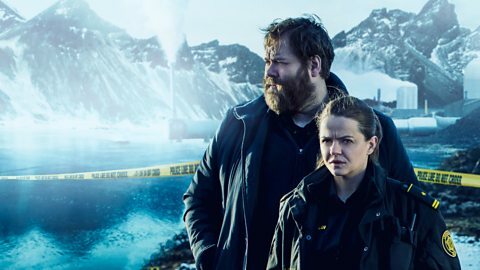 Love, love LOVE Andri (aka Olafur Darri Olafsson who stands at 6ft 5in as looks like a giant, wooly bear) and the taciturn Hinrika (Ilmur Krisjansdottir). What's not to love, though both could do with cracking a smile now and again.